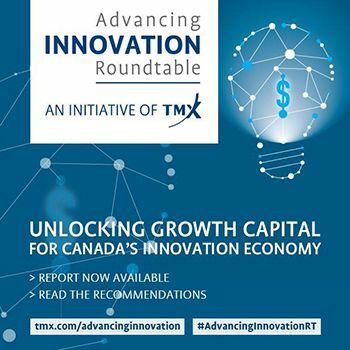 The Advancing Innovation Roundtable, a 12-member independent working group, last week published its recommendations report on how to increase access to growth capital for Canadian innovation companies as they progress beyond the seed and startup stages. Funded by TMX Group, the Roundtable is a private sector initiative bringing together leaders across the financial services industry, including finance, investment and capital formation. Formed in October 2016, the Roundtable is a unique, investor-led collaborative effort that is directly aimed at improving the capital supply for growth stage companies, creating better conditions for their development in both private and public markets, and strengthening the infrastructure needed to support Canada's innovation ecosystem more broadly. The Roundtable recommendations are organized into three categories: 1) institutional capital, 2) public markets and 3) ecosystem foundations. Each recommendation is supported by specific, viable proposals that are actionable immediately. Click on the links below to read the Executive Summary and/or the Full Report. TMX is focused on powering the development of an innovation economy in Canada, and we are proud to fund this landmark initiative. This initiative will help inform ongoing national conversations regarding the development of Canada's innovation economy, the recommendations and proposals will contribute to building an effective strategy to enable this country's technology companies to achieve long-term success. For more information, please visit www.tmx.com/advancinginnovation.